Posted on Mon, Mar 19, 2012 : 3:14 p.m.
Al Borges spoke to the media for the first time this spring. But perhaps the most intriguing thing to come out of the 20 minutes with the Michigan football team's offensive coordinator on Monday was something he didn't say at all. Asked if backup quarterback Devin Gardner is working out at receiver this spring, Borges replied: "Practices are closed for a reason." The Wolverines have made no secret they would like to make Gardner a regular component of their offense, and they did that last year when they added a "deuce formation" that got him on the field at quarterback. Regular quarterback Denard Robinson moved to tailback or receiver in those sets, although he never ran routes. Borges said the plan will be similar going forward. "We're doing what we did a year ago, pretty much," he said. "We're going to play the best 11 guys. Devin's a backup quarterback right now, he's No. 2 and we're going to do what we've got to do to get the best 11 on the field. "We've pretty much got the same mentality that we had." Borges said Michigan will work on the deuce this spring for about four or five practices, although not right away. "Once we (get that down), then we'll start dabbling a little bit more into the offseason research we've done on some stuff," Borges said. That's where things get interesting. Borges showed last year he likes to keep things fresh, rolling out a variety of wrinkles as the season progresses. The speed option and deuce formation were among them. What form that trend takes next year probably won't be known until the season starts, but there's little question it will somehow involve Gardner. Although Borges wouldn't say Gardner was lining up at wideout in spring practices, he did later add: "(We'll) see to it we use him getting the ball, using him throwing the ball, and using him decoying." Gardner is a junior from Inkster High School. He was a five-star recruit coming out of high school, and ranked the country's No. 1 dual-threat quarterback. 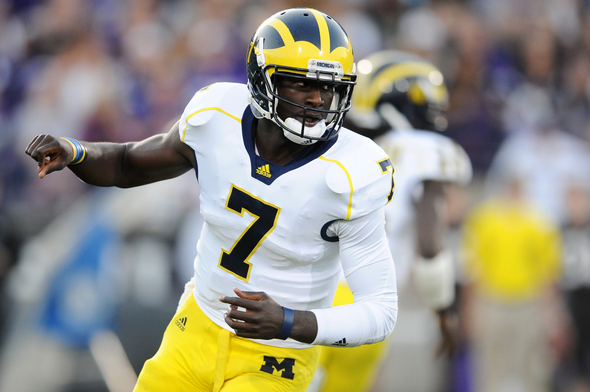 He came to Michigan to play in former coach Rich Rodriguez's spread-option attack. However, he has been buried behind Robinson on the depth chart, and that again will be the case next season when Robinson returns for a third season as the starter. Complicating things is Gardner also played in three games as a freshman, which could preclude him from earning a fifth season (and two seasons as the full-time quarterback). He won't know the NCAA's decision until next year. That means it is possible he will only get one season as a full-time quarterback, which enhances the incentive to get him on the field in the interim to take advantage of his athleticism. "He’s an incredible athlete," Borges said. "He’s got so many dimensions to him, and he’s smart, so he picks stuff up fast. Doesn’t have any problem that way." Gardner was 11-of-23 passing last year for 176 yards and one touchdown. He also ran 25 times for 101 yards and another score. Wed, Mar 21, 2012 : 2:24 a.m.
Maybe Devin wants to help the team and having him ride the pines is a waste of talent. Tue, Mar 20, 2012 : 11:43 p.m.
Backwards. Denard becomes a receiver with Devin throwing the bomb. Thu, Mar 22, 2012 : 1:07 a.m.
with the way Denard throws his bombs...gonna need a 6-5 guy who can jump on the other end...this is a smart play moving Devin to WR. His growth was limited at QB. Tue, Mar 20, 2012 : 8:12 a.m. They played Denard too much thanks to everyone's love affair with him and stunted the development of Gardner. Sad that he was the best dual threat QB recruit in his class and gets stuck playing behind a single threat QB. Also sad that they've decided to draw plays for him in his last season and ran crappy spread plays designed for Denard until now. Tue, Mar 20, 2012 : 12:45 a.m. This is a great idea. At 6'4 210 with great athleticism he could be tremendous. It might help him in the 2014 draft as he'll only have one full year under center before BELLOMY starts. Tue, Mar 20, 2012 : 12:41 a.m.
U don't want to get him hurt but if he is that good u have to get him in more games somehow. Mon, Mar 19, 2012 : 10:49 p.m.
Can you imagine losing a winnable game because Denard is sitting on the bench. I think our coaches have a bit of gambler in their blood but I don't think they are reckless gamblers. Tom Brady waited his turn, wasn't it one full year at QB. and Tom did just fine at the next level. Wouldn't it be just dandy if Denard's accuracy greatly improved for 2012 ? If Denard could get that arm under control this year I think the sky would be the limit for the Wolverines. Mon, Mar 19, 2012 : 10:40 p.m.
Tue, Mar 20, 2012 : 11:14 a.m.
Ronnie, thanks for the update and the link! Tue, Mar 20, 2012 : 1:59 a.m. I never thought he would be eligible. Richrod made up the Devin back injury after the ninth game of the season. I don't think the ncaa is going to play that game. Interesting comments from Al. I would hope that the staff does not forget about Russell Bellomy who is an explosive athlete, and is the 3rd QB. I hope that he gets a fair shot to compete with Devin and Morris because he may be surprising in what he can do at QB. Tue, Mar 20, 2012 : 12:47 a.m.
Bellomy is tremendous!!! tall, smart, very accurate thrower. Oh and he can run. Tue, Mar 20, 2012 : 12:15 a.m.
Im sure the coaches are well aware of the ability of each of the the QBs. Mon, Mar 19, 2012 : 8:55 p.m.
Tue, Mar 20, 2012 : 12:50 a.m.
No way a freshman starts over a five star athlete who has had three years to learn the system. Morris will red shirt next year and won't likely start until his redhsirt sophmore year after Bellomy has played two years. Mon, Mar 19, 2012 : 8:52 p.m. I agree that to experiment with Devon in positions - it could only be a win-win situation if something develops for him. He is built a lot like AC in stature, so just maybe. And Devon would still be available for QB or options if necessary. I believe it's this continuous 'thinking' by Borges and coaches that will make the difference in the long run. MgoBlueForTim....let no one get splinters from the bench. Tue, Mar 20, 2012 : 1:56 a.m.
the only thinking borges did that was worth a crap was scrapping the west coast offense. He found out within a couple games Denard didn't have the arm for it. He just can't get away from the west coast thinking. That is why he hasn't given up on getting some plays for Devin. Problem with that, Devin's a less than 50% passer also. You need an accurate qb to play the west coast style possesion passing game. Mon, Mar 19, 2012 : 8:53 p.m.
Mon, Mar 19, 2012 : 8:43 p.m. He is tall, has an arm and can run. If he had more time in I think we would all be impressed with his performance. Mon, Mar 19, 2012 : 8:42 p.m.
Gardner isn't going to any new position. He's going to stay at QB period. Anyone who looks at the depth chart will see only 3 scholarship QB's, and one of them is a redshirt freshman who hasn't seen a single snap in a game. Gardner is only one play away from being the starter. So, it's critical he stays at QB. That being said, I agree completely with Borges decision to try and find creative ways to use his athletic ability and experience on the team. Tue, Mar 20, 2012 : 3:21 a.m. Exactly why they should have Denard throw the ball to Devin. Denards too small - and like you said- maybe he can't catch. Devin is tall. Tue, Mar 20, 2012 : 1:51 a.m.
Denard has been running plays at receiver for 3 years and he has yet to catch a pass. He must not be able to catch because you would think he could get seperation with his speed. Tue, Mar 20, 2012 : 12:43 a.m.
Why can't Gardner be Denard's backup while he's playing some downs as receiver? He doesn't have to sit on the bench as the backup- they don't throw other receivers off the team if he's playing. Denard has neveer missed a game and Gardner has never missed a game and Bellomy is very capable. he redshirted because they had no need for him. Your comment makes no sense. I hope he get's his medical red shirt and sticks around another year. That will give Morris a chance to grow a little. Tue, Mar 20, 2012 : 12:35 a.m.
Bellomy is said to have the best touch in his throws of any of the QB's. don't count him out as a starter before Morris. Mon, Mar 19, 2012 : 7:56 p.m.
Devin would be an incredible wide receiver, that may be his best route to the field and NFL. Tue, Mar 20, 2012 : 4:36 p.m.
DB, The guys has never caught a pass in high school or college and you compare him to Jerry Rice? You kill me with that crap. You don't know if he can make a cut with out tripping over his own feet. Tue, Mar 20, 2012 : 11:41 a.m.
Jerry Rice was not a speedster by no means. People kill me with that speed crap. I love it no doubt, but give me intelligence and awareness anytime. And if u can run routes and catch passes as a receiver u have value. Tue, Mar 20, 2012 : 1:49 a.m.
Devin is too slow to play receiver in the NFL. He runs a 4.7 , 40. He would need to bulk up and play tight end. Mon, Mar 19, 2012 : 7:42 p.m. So Borges if you're feelin' good, And Borges if you're feelin' nice, You know Devin's been workin' hard.... He's worth a Deuce!! Mon, Mar 19, 2012 : 7:40 p.m.
1 touchdown: 1 interception (should have been two) &quot;he's a smart kid&quot;, I believe it. but its when he decided to run backwards 25 yards against MSU where i question his decision making. Tue, Mar 20, 2012 : 3:19 a.m.
Wow. Thanks. That clip was an ugly- if athletic play. I can see why I blacked it out. One thing about that clip. Gardner is A LOT faster than I thought he was. He ran at least 80 yards on that play. Seriously. This clip more than anything makes me think he would be a great-not good receiver. If he put on a few more pounds and lowered his shoulder at the right time-he'd be Calvin Johnson. Tue, Mar 20, 2012 : 2:38 a.m.
Tue, Mar 20, 2012 : 12:53 a.m.
Gardner ran backwards 25 yards against MSU? I must have missed that one.